With the 2019 NFL season still months away, fans are anticipating how some of the new personnel might perform. Thanks to EA’s Madden 19, gamers are able to simulate some of the big offseason roster moves’ effects on teams. However, there are also NFL players previewing how things might work out, including star player Le’Veon Bell. Disgruntled Pittsburgh Steelers player Le’Veon Bell was one of the biggest offseason free agency moves. Bell didn’t participate in the 2018 NFL season with the Steelers due to stalled contract negotiations. Ultimately, he’d sign a new deal worth $52.5 million over four years with the New York Jets. That will pair him with young quarterback Sam Darnold. 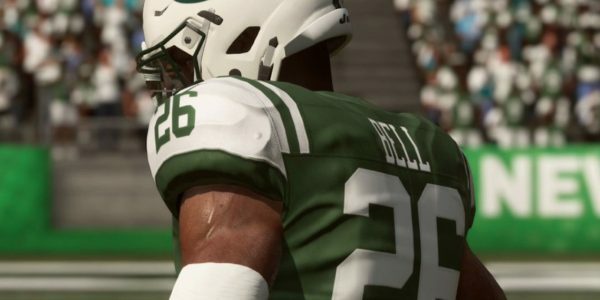 Bell seems to be gearing up for the next chapter in his NFL career with some highlight previews on Madden 19. Per USA Today, Bell recently tweeted a video clip from the game showing off Darnold finding him for the long touchdown. Not only was it Bell scoring, but he was doing it against the Super Bowl champions. The New England Patriots are officially on notice. When the Madden 19 game launched, Bell entered as a 96 OVR. Not playing during the season cost him that number, as he eventually fell all the way to a 93 OVR by the end of season ratings. However, he received a 98 OVR Masters card as part of the Ultimate Team Free Agents promotion. That card features a 95 Speed, 96 Acceleration, and 98 Agility amongst other key attributes. So far, it’s unknown how the Sam Darnold to Le’Veon Bell pairing will play out over the 2019 NFL season, but it certainly has fans excited. Bell seems ready to actually play again too. Could he possibly become the next Madden game’s cover athlete, joining his former teammate Antonio Brown? One would have to think he could be amongst candidates even without playing a down last season. Get more of our news, information, and guides at the Madden page here.